Wingsinflight - Gardening to create habitat for birds. Putting up feeders is probably the fastest way to attract birds local to your area. There are so many types of feeders to choose from it can be hard to decide. However providing berry producing shrubs for food and cover is also important, not just for the birds but also for the other animals and insects that will be attracted to those plants. Below I've listed the main types of feeders that I've used in my yard as well as a list of shrubs future down that attract birds. black oil sunflower and Safflower seed. Placed at the higher level I hang a couple of different tube feeders on the fence but they can also be hung on poles. They attract birds that are more comfortable off the ground including Jays, Cardinals, woodpeckers, Finches, Chickadees and Titmice. Tube feeders come in many sizes and are also the best for holding Sunflower seed. There are two types of sunflower - Striped and Black Oil. Both are attractive to birds but the black oil variety have a higher fat content for the size of the seed. The smaller birds such as chickadees and finches prefer the smaller black oil sunflower. However as far as Cardinals and Blue Jays go, at least at my feeders, they both prefer the larger striped sunflower, probably because they have larger bills designed for a larger seed. I mix both Striped and Black Oil sunflowers along with Safflower seed and put these into my tube feeder. Cardinals love Safflower as much as Sunflowers, as do Titmice. Some tube feeders are made to attract Finches such as Goldfinch, Purple and House finch and Pine Siskins. These are called Thistle feeders and are used to contain the finches favorite food - the very fine Thistle or Niger seed. Their tiny sharp bills fit through the smaller holes thus keeping many of the larger birds away from the feeder. Tying a yellow ribbon to the feeder helps in attracting the attention of goldfinches flying through the area. 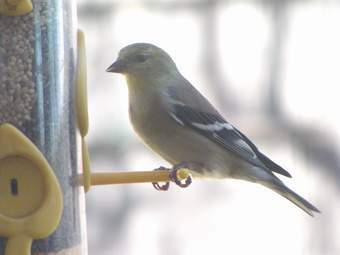 American Goldfinch at Thistle Feeder containing a mixture of Thistle seed and mixed finch seed. Again they come in many types and sizes and are mainly used to attract Woodpeckers but Jays, Mockingbirds and Nuthatches will also come to suet. Suet can be bought in cakes specially made to fit inside the wire cages or recipes can be made at home. Homemade feeders can be made out of tree logs by drilling 1-2" holes along the log, filled with suet and hung. Suet can also be smeared into cracks and crevices on tree branches or in chunks at a platform feeder. I use a couple of suet feeders here but I always make sure they are hung so only the underside is accessible. This is to keep the Starlings away from the suet as they don't like to swing to much and are not able to hang upside down for too long like woodpeckers can. If given the chance starlings will eat your suet for hours! I use several feeders in my yard to attract the hummingbirds but they also get a great deal of nectar from my plantings. In my area I get the Ruby Throated and Black-chinned Hummingbirds. Syrup feeders can also be used to attract Orioles and normally come colored in Orange as apposed to the red for hummers. For hummers, I do not recommend using water that is already tinted red and do not add food coloring to make the syrup red either. 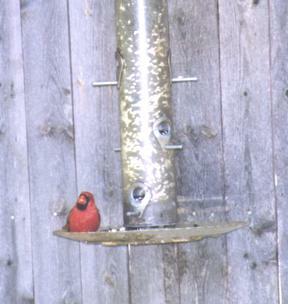 The feeder should have enough red on it to attract the hummer. To make the sugar water mix 1 part sugar to 4 parts water. (do not use less water than this as it can cause damage to the hummingbirds kidneys) Add to a saucepan and bring the mixture to a boil. This will kill any bacteria. Allow to cool before putting into the feeders. If making a large batch the syrup can be kept in the refrigerator for up to a week. Water may have to be changed every couple of days depending on how many hummers you get and how high the temperatures are. Mold can grow very quickly with hot weather. Also if the feeder can be hung in the shade somewhere even better. Hummingbirds can be very territorial and will guard "their" feeders from any other hummingbird trying to use it. To help prevent this space the feeders far enough away or out of sight of each other. In some locations where hummers are very plentiful, grouping of feeders does not seem to be a problem. HINT - It is best not to use soaps or detergents when cleaning the syrup feeders, using very hot water and some brushes made for hummer feeders, to clean the inside. Howeveer, if you do it easier to clean them with dishwasher powder instead of washing up liquid, as it won't develop lots of soap suds! If you use this method, be sure to rinse THOROUGHLY. Another feeder I like to use is the peanut cage. A simple cage with holes just large enough to allow birds to take out shelled peanuts. However this is a very popular food being eaten very quickly and can be expensive. A treat for the mockingbirds - I like to use grape jelly! I just place a teaspoonful at a time into a shallow dish. They love it. Also pieces of fruit such as grapes and apples will also be eaten by Mockingbirds and Robins as well as mealworms placed into a container such as a shallow dish which they can not escape from. Don't forget oranges for the Orioles! I like squirrels and do not mind if they use my feeders. 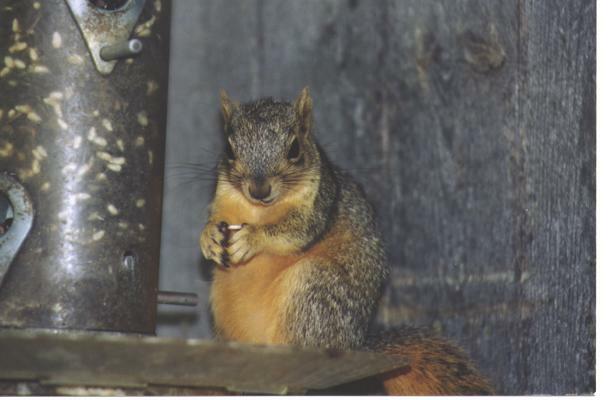 At least in my garden they do not eat ALL the seed, having plenty of other acorns and Pecans around to feed on. However if you have problems with squirrels purchase a baffle. This usually consists of a plastic dome placed either over and/or under the feeder. With any type of feeder setup, be sure to keep the feeders and the surrounding area clean to help prevent any bacteria from spreading. Wash feeders frequently with a very mild bleach solution and be sure to rinse well. Keep all seed husks below feeders cleaned up also. Providing a source of water is just as important, if not more important, in attracting birds and other wildlife to your yard. Providing water can be done in so many ways from a simple dish on the ground to a lake. Here I have a couple of bird baths, a mister / dripper combination which falls into a small puddle below and also a pond with a waterfall. The sound of moving water is a magnet to birds but you don't have to have a pond. 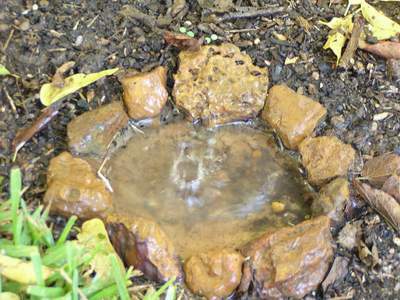 There are many bird baths now that you can fit with misters and dripper's to attract birds to your yard. Hummingbirds love misters, flying through them to bath and drink. Other birds are drawn to the dripper's you can attach to bird baths, hanging upside down to swallow droplets of water. Bird baths can be on or off the ground. Place them within range of some bushes or trees that birds can escape to in case of predators but try and keep the surrounding area clear so that cats or other animals cannot lie undetected. Pedestal bird baths have the advantage of being that bit higher up and many birds feel safer using these than ground baths, but will use both. Choose which type you prefer depending on your setup or see which the birds prefer. This is a puddle into which drops of water fall from a dripper overhead. Bird Misters, Drippers & Puddles Page! Again these come in many varieties to attract all kinds of birds. One thing I recommend is to do all you can to prevent the nesting of the Eurasian House Sparrow and the Eurasian Starling. These birds are not native to this country and do a lot of damage to native birds and their eggs. If you purchase, or make, a standard Wren house for example make sure the hole is no larger than 1 1/4 inches as sparrows will enter anything larger, sometimes even this size. 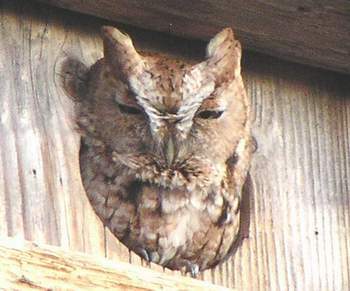 For this reason I converted all my wren boxes to a 1 inch hole and I've attracted them for several years. Before, they were always filled with sparrows! You can easily add a new piece of wood to the front of a box with a smaller hole. Shrubs are a great way to attract birds, not just for food but also for shelter, cover from predators and places to raise young. The most useful bird attracting shrubs are those that are "evergreen" (keep their leaves year long) and those that produce edible berries and seeds. Below is a range of bird attracting trees and plants that grow in the Central North Texas area as well as some other states. There are many other plants that produce berries that birds love, such as Pyrecantha and Cottoneaster, however in this list I've only included those native to our area, although I also have Pyrecanthas which are loved by our Mockingbirds. Check which plants are native/adapted to your region. You can also check the National Wildlife Federations Native Plant Guide to see which plants are native to your region. Oaks - Blackjack, Bur, Chinquapin, Post, Live, Shumard Red, Southern Red, Southern Live. to find bird seed, feeders, boxes and other links.